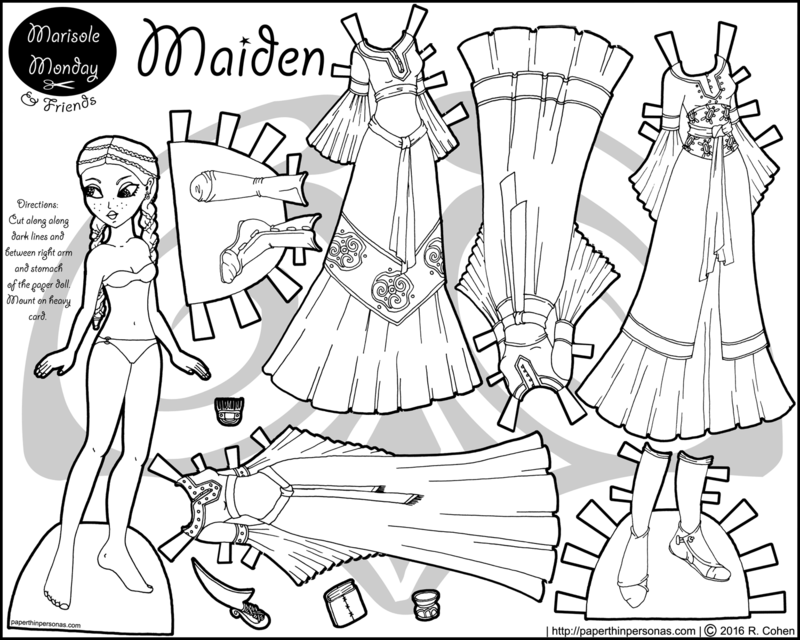 Another printable princess paper doll this week. Clearly, I was in the mood to draw fantasy dresses. I did think about trying to get some other sets done and then breaking up my princesses, but in the end, that just didn’t work out. So, May has become a month of printable princess paper dolls for the Marisole Monday & Friends crowd and people are just going to have to deal. So, in the 12th century, there was this garment called a “bliaut.” Now, I’ll be honest, I am still learning about 12th century clothing, but in my limited research the “bliaut” was a wide sleeved gown with a full skirt. The most famous example, I know of, is from the sculptures on the exterior of the Cathedral of Notre-Dame de Chartres. Another example is the Unshaw Virgin from the British Museum. I’m still mid-research to create a historical 12th century paper doll, so while I work on that, I thought I would draw a fantasy paper doll inspired by the 12th century. Along with the 12th century, Maiden here owes a bit to Norse things with her bone comb and her knife. I think she could be a generation or two removed from my Maiden of the North paper doll from last year or maybe from the same “world”, but a different geographic region. I also think Marcus as a Warrior fits in as well. Now, I will confess that I did try to make something very different from Monica’s Dreaming Princess set here. Despite the fact that they are both fantasy paper dolls with a distinctly princess vibe, the styles are pretty different. Maiden here is all about the 12th century while Dreaming Princess was all about the early Italian renaissance look. Plus, while Dreaming Princess was modeled by Monica, Margot is the model for Maiden, a title picked entirely because it fit in the space I had left after rearranging this set like a dozen times. For colors, I wanted to use shades that reflected manuscript illustration. While Dreaming Princess was me channeling my inner-8 year old. This paper doll was much more my taste which tends towards more muted colors when I think of fantasy gowns. Now, next Monday, there will be something completely different! Also, if you’re wondering, “Who is this Margot person Rachel keeps referring too?” Than allow me to refer you to the Guide to Marisole Monday & Her Friends. Questions? Comments? I’d love to know what you think of today’s paper doll. She is absolutely beautiful! I love how the muted blue, orange and green look together! I love it! I like how the hair matches the era! The colors are fantastic (again). I really love the pale blonde hair. And you always have such a knack for shoes! Is it a cup beside the book?